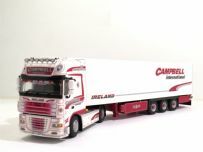 Welcome to our online shop, a place dedicated to Truck Models. Here you will find all of our 1:50th scale Diecast Models we have on sale, these include high quality collectables from WSI Models, Tekno and IMC. Also, models planned for the future by some of the above manufacturers. We hope you enjoy the site as there are plenty of pictures to view. Truck Models can be purchased straight from the website. We can also take pre-orders for forthcoming models, including any WSI or Tekno models by email or the checkout system.